If you had just met Adam, you would never tell that just a few days ago, he was homeless. Walking down Sunset Boulevard in his newly coveted “Gray Shirt”, Adam walked with a sense of purpose and understanding. Today, he played the part of the mentor and leader – the type of person that everyone should know regardless of their current situation. 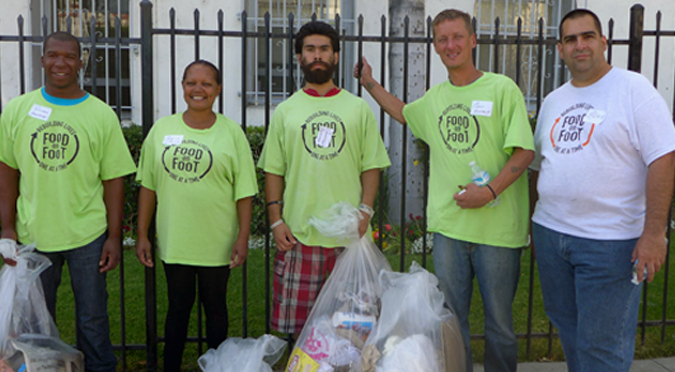 Surrounding him were four “Green Shirts” in Food on Foot’s Work for Food program. These people were homeless and were spending their Sunday picking up trash on the streets of Hollywood as a means to better their lives, gain confidence and ultimately leave the life on the streets with a full-time job and an apartment they could afford. 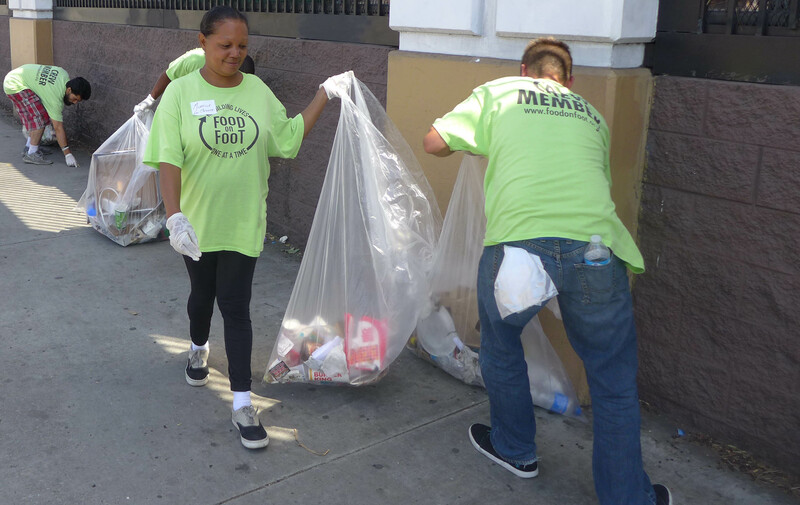 As the Communication Manager for Food on Foot, I followed this crew on their cleaning route in order to learn more about what they go through while in the program. The Green Shirts in the Work for Food program clean the streets of Hollywood in return for fast food gift cards. After approximately ten weeks of demonstrating reliable work habits and acting professionally and responsibly, a Green Shirt can move up to a Gray Shirt (like Adam) where he or she supervises the cleaning route. After proving one’s ability to show up on time and accomplish goals on a consistent basis, Food on Foot assists the Gray Shirt in finding a full-time job and an apartment they can afford. 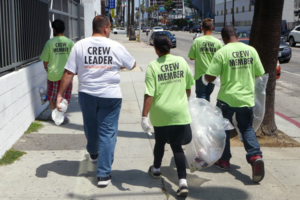 While walking the stretch of Sunset Boulevard, between Cahuenga and Western, the crew’s trash bags began to fill with remnants of past possessions – cigarette butts, Styrofoam cups, and the occasional broken clothes hanger. Every so often I would stand back and observe the crew while marveling at how they interacted with their new leader. 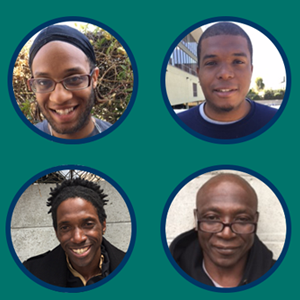 I was taken aback to think that several weeks prior, Adam was like them – a brand-new member of the Work for Food program. 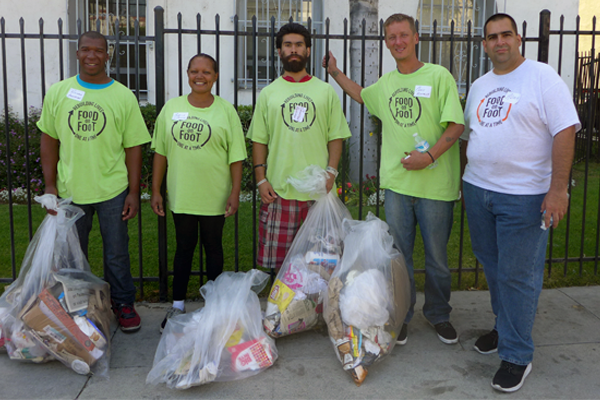 As with these Green Shirts, Adam had recently walked the same Hollywood streets, picking up trash and reflecting on his situation as a homeless person. And just to think that in a matter of weeks filled with determination perseverance, Adam now had a full-time job and an apartment. 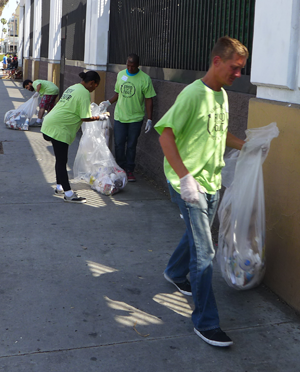 While picking up trash and demonstrating one’s work ethic is an essential part of the Work for Food program, I noticed an additional benefit that these Green Shirts were exposed to during their time on their cleaning route – the benefit of communication through a dialogue made up of comradery, honesty, and teamwork. “You have to look at the big picture,” Adam explained to his crew while waiting at a crosswalk. “Don’t focus on the food gift cards. Instead, focus on getting that Gray Shirt. Focus on getting out of the shelter and getting that job in 90 days. The gift cards are great, but that’s just an extra bonus at the end of the day.” The crew listened attentively as Adam gave tips on how to progress through the program. I could tell they looked up to him and trusted him too – something that’s missing in our society today. A few blocks later, the Green Shirts began commenting on their own homeless experiences and what advice they could offer to one another. Before turning around to head back, we stopped into the Food 4 Less parking lot for a quick break. Sitting along a cement embankment, Adam continued to mentor his Green Shirts, some of which had entered the Work for Food program that very day. And the brilliance of Adam is that he doesn’t take Food on Foot for granted. In fact, he doesn’t want his involvement with the organization to end once he graduates. He’d like to continue mentoring people and giving back, just like Food on Foot did for him.